You’ve decided that it’s time to do something about your missing teeth, because the years of feeling insecure about your smile have taken a toll on you. You’ve heard a lot of good things about the dental implant process, and you’re considering trying it out. The only thing hindering you, though, are some unanswered questions that you have. Your local dentist has some answers for you about dental implants of Collierville to help you make the best decision. Dental Implants are titanium posts surgically inserted into your jawbone that fuse and form a firm foundation, acting as your roots. After healing, your dentist will attach either a crown, bridge or implant-retained dentures. These will function as your normal teeth and are permanently attached, so there’s no removing and soaking at night. Here are some frequently asked questions with the answers provided. These will help you get a fuller understanding of what the dental implant process entails. 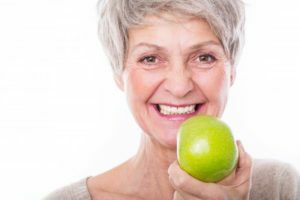 What are Some Advantages of Dental Implants? Dental implants offer several advantages. They are convenient, because they don’t require any special cleaning other than that which your render to your normal teeth. They are also permanently attached, which means that they won’t fall out, nor do you have to concern yourself with removing them at night. How Much do Dental Implants Cost? This is a customized process, so the cost can vary because no two people are exactly alike. However, recent data shows that the average cost is $3,000 to $4,500 per tooth. Contact your local dentist for a more accurate projection. Are Dental Implants Covered by Insurance? Recently, some insurance carriers have started covering this procedure, but if yours doesn’t, you can inquire about an allowance towards dental implants equal to the cost of a bridge, or traditional dentures. Who Should Perform the Dental Implant Procedure? It is of the utmost importance that you utilize a skilled, experienced dentist in Collierville for this very tedious procedure. You now have some more information to help you make your decision. Reach out to your local dentist to ask any questions. But don’t wait too long because the quicker you correct this problem, the less chance you have of suffering from facial collapse and bone degeneration. Your time has come to enjoy the smile that you’ve wanted for so long. Take advantage of the information available to you so that you can make a confident decision. Joshua A. Holcomb DDS has been practicing general dentistry for over six years and remains dedicated to remining versatile, as he practices fixed and removable prosthodontics, oral surgery, implantology, conscious sedation, reconstructions and endodontics. He received his B.S. in Biology from the University of Memphis and earned his Doctor of Dental Surgery degree from the University of Tennessee at Memphis College of Dentistry. He practices at Joshua Holcomb D.D.S. and can be reached for more information through his website.